Welcome to the website of the 5th edition of the Robot Vision Challenge! 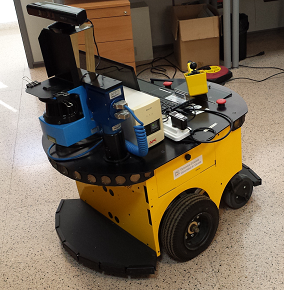 The fifth edition of the Robot Vision challenge follows four previous successful events. As for the previous editions, the challenge will address the problem of semantic place classification using visual and depth information. This time, the task also addresses the challenge of object recognition. 10/12/2012 - The task has been released. 31/05/2013 - Results release: The results for the task has been released. The winner is the MIAR ICT group. The fifth edition of the RobotVision challenge will focus on the problem of multi-modal place classification and object recognition. Participants will be asked to classify functional areas on the basis of image sequences, captured by a perspective camera and a kinect mounted on a mobile robot within an office environment. 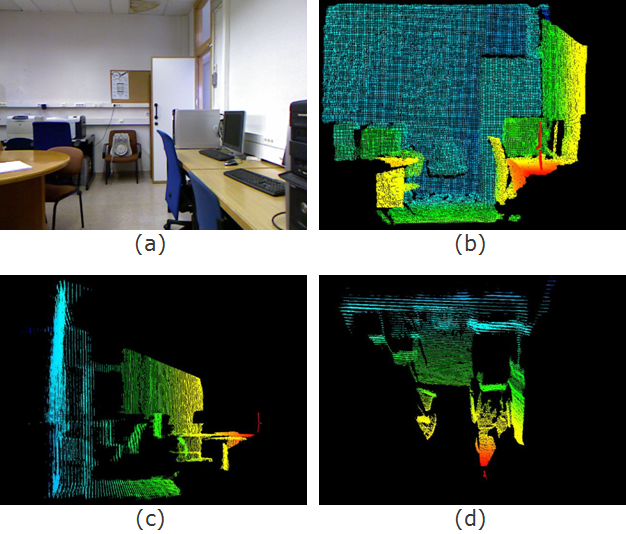 Therefore, participants will have available visual (RGB) images and depth images generated from 3D cloud points. Participants will also be asked to list of objects that appear in the scene. Training sequences will be labelled with semantic labels (corridor, kitchen, office) but also with the objects that are represented in them (fridge, chair, computer). The test sequence will be acquired within the same building and floor but there can be variations in the lighting conditions (very bright places or very dark ones) or the acquisition procedure (clockwise and counter clockwise). Taking that into account we highly encourage to the participants to make use of the depth information in order to extract relevant information in extreme lighting conditions. As a novelty for this year, the provided training sequences of images will be labelled with a set of objects (previously defined) that appears within these images. Therefore proper recognition of objects will produce higher score in the evaluation procedure. 10/12/2012 - Release of the task. 28/01/2013 - Training data and task release. 09/04/2013 - Test data release. 15/04/2013 - Submission system open. 17/04/2013 - Validation data release. The first one is the typical question for semantic place classification, that is "where are you?" when presented with a test sequence imaging a room category seen during training. The second question is, “what objects are you seeing in that place?”. The set of recognizable objects are predefined according to the typical objects that can appear in the different imaged places in the provided sequences. In both cases participants are allowed to make use of the temporal continuity of the sequence. The main novelty of this edition will be the information of the presence or lack of a set of predefined objects in the images. There are several sequences of visual and depth images. Visual images are stored using the .png format while depth images use the .pcd one (distance information + colour). The following image shows an example of a visual and a depth image from the same scene. Two training sequences are provided at the task release. An additional (labelled) validation sequence will be provided in next weeks to allow participants to evaluate their proposals with a sequence similar to the test one. Finally, the unlabelled test sequence will provided. 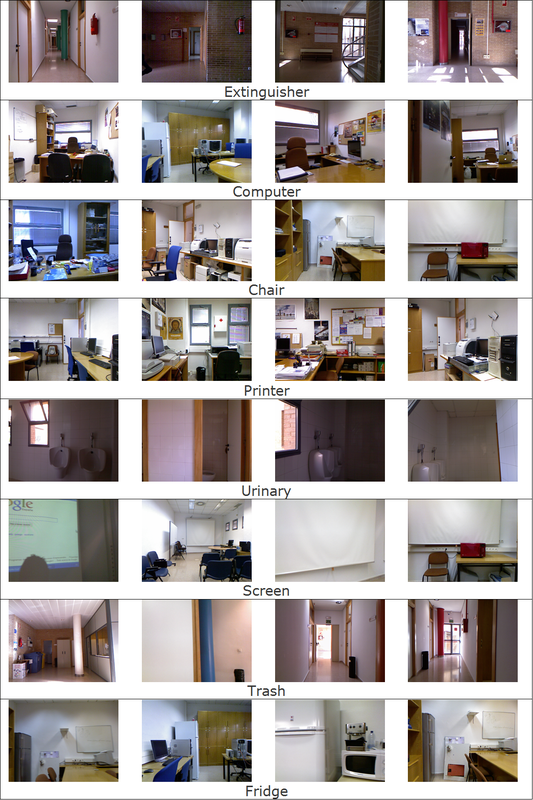 For each frame in the test sequence, participants have to provide information related to the class/room category (1 multiclass problem) but also related to the presence/lack of all the objects listed in the dataset (8 binary problems). The number of times a specific object appears in a frame it is not relevant. The final score for a run will be the sum of all the scores obtained for the frames included in the test sequence. Three example of performance evaluation for a single test frames are exposed in the following lines. Each line in the results file should represent a classification result for a single image. Since each image can be uniquely identified by its frame number, each line should be formatted as follows: <frame_number> <area_label> list of <object_i> or < !object_i> As indicated above, <area_label> can be set to "Unknown" and the image will not contribute to the final score (+0.0 points). In a similar way, any presece/lack of an object can be avoided and the objecy will not contribute to the final score (+0.0 points). Article to refer: A. Bosch, A. Zisserman, and X. Munoz, “Representing shape with a spatial pyramid kernel,” in Proceedings of the 6th ACM international conference on Image and video retrieval. ACM, 2007, p. 408. Article to refer: Mark Hall, Eibe Frank, Geoffrey Holmes, Bernhard Pfahringer, Peter Reutemann, Ian H. Witten (2009); The WEKA Data Mining Software: An Update; SIGKDD Explorations, Volume 11, Issue 1.